We had the good fortune to perform for Jeremy and Laura’s event as the DJ at Oak Tree Manor in March of 2016! This now one-hundred and forty-year old home was built in 1876 by German immigrants during the time of horse drawn carriages, railroad tracks and old saloons. The original homesteaders were the famous Wunsche Brothers of Old Town Spring. The house sits on its original site on Spring Stuebner Road and is surrounded by century-old oak trees, some more than two hundred years old. One Live Oak on the grounds has qualified to appear in the Harris Country Tree Registry. [Download .pdf file], and one Willow Oak has been recognized as a country-wide champion in its category. Through the years, the only major additions have been a living room and a master bedroom. Wherever possible, the original wood has been preserved. Most recently, a Gazebo, swimming pool, outside patio and grill area have been added. 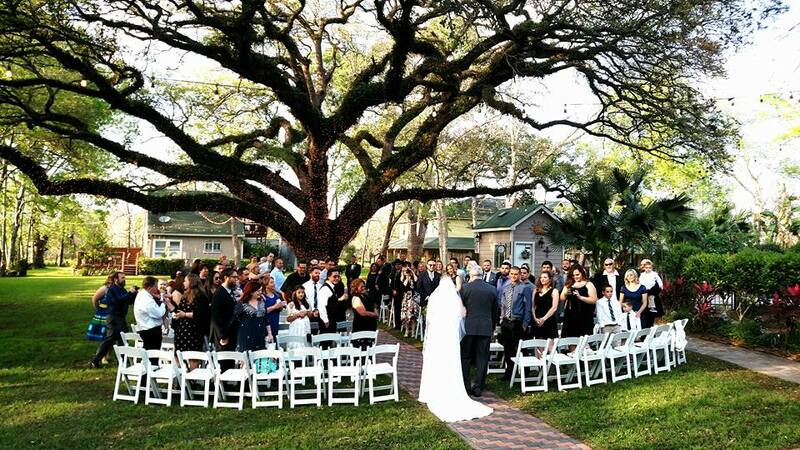 From generation to generation, countless weddings have been performed under the shade of the two-hundred year old oak tree. Local folklore has it that weddings under this tree will be blessed with happiness, children and, of course, beautiful love.